By the mid nineteenth century there were an estimated 300 readers or correctors of the press in London – around half of them working only part time. As with so many jobs of the period, the hours were long and the pay meagre; “less than those who have merely mechanical skill to offer”, as Henry Vernon complained in a letter of 1854. Vernon, a reader at Bradbury and Evans, which published Punch magazine, and his colleague William Richards wrote by hand to 150 readers in the capital that August inviting them to a meeting at which an association would be formed to protect their interests. Responses were to be sent to “Delta” – in reality JM Philps, like Vernon a reader at Bradbury and Evans. 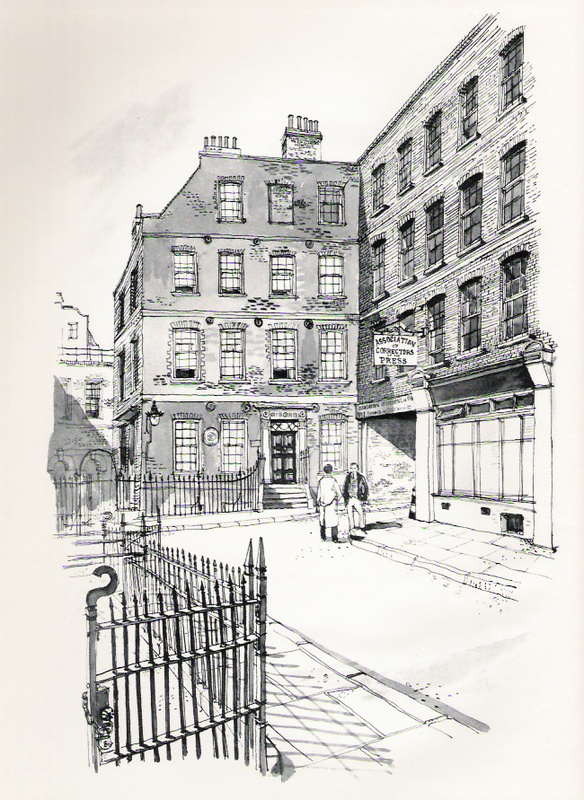 On 4 September 1854, the first meeting duly took place at the Falcon Tavern, Fetter Lane . The minutes do not record how many attended, but in the chair was Richard Maurice, yet another employee of Bradbury and Evans. The meeting agreed unanimously to form a London Association of Correctors of the Press, and formed a committee to draw up its rules. Philps was appointed secretary, on an annual honorarium of £6, while W Johnson Jnr, who worked at 121 Fleet Street , became treasurer. The principal aim of the new society was to match members who were out of work with vacancies. Membership was restricted to those working as correctors of the press within a 15-mile radius of the General Post Office in central London . In the association’s centenary history, Passed for Press , TN Shane, a former TUC press officer, argues that the association was not at this stage a trade union – and points out that it was known somewhat dismissively to members of the compositors’ and other unions as the comma club. Its minutes of the period show members to have been largely absorbed in self-improving lectures on everything from orthography to “the doctrine of philosophic necessity”. Although the association had continued to meet in the Falcon, it relocated first to the Mitre then to other venues after the landlord double-booked the correctors and the freemasons, then compounded his mistake by offering the correctors a “lumber room” for their meeting. Although membership remained at just under 100, activity was almost non-existent. There was very little unemployment among readers, and little incentive to attend meetings. The minutes of one, dated 3 July 1860, records the “now regularly established audience of four”. The correctors were nothing if not erudite. On one occasion, Edward Pincott played a joke on fellow members by issuing a notice that his brother Frederick would present a paper on Sanskrit grammar to the next meeting. His bluff was called when Frederick duly delivered the promised speech. The prank did not prevent Edward Pincott from becoming secretary in 1862. But the appointment was not universally popular. After weathering one row with his colleagues over his expenses claims, Pincott eventually resigned in 1867 – and at the 13 th annual meeting on 7 January 1867 was barred from giving his reasons on the grounds that he was no longer a member. Although the first suggestion that the association should constitute itself as a trade union came as early as 1866, when the matter was raised by Mitchell, the idea was almost completely ignored. It took two changes of secretary before George Chaloner eventually set up a committee to look into the problems facing readers. It duly reported that, of 195 full-time readers in London , only two earned more than £2 a week, while many earned no more than 36 shillings. Working time varied from 45.5 to 60 hours a week, with an average of 53. Neither was there any prospect of promotion to better paid jobs outside the “reader’s box”. The association duly presented a demand for a 10% wage rise and better regulated overtime. It backed up its claim with a public meeting, at which the author Charles Dickens was persuaded to take the chair (read his comments below). Dickens was not just a well-known writer; as editor of the Daily News in 1846 he had paid considerably higher rates than were common elsewhere. The association still maintained that it was not a trade union, and Chaloner assured the meeting that there was no intention of a strike. In due course the association’s leaders were invited to put their case to the Master Printers Association – the employers’ body. They made little progress however – not least because there was no pay scale that they could seek to improve. The employers simply recommended that each reader should apply individually for more pay. Throughout the 1880s, the association continued to maintain that it was not a trade union, refusing invitations from the London Society of Compositors to join a federation of print unions and refusing to support its pay claims with practical help. Although Frederick M Hyman, a reader on the Daily Chronicle , nearly succeeded in reversing this policy in 1893, detailed proposals to become a trade union were eventually thrown out by the membership. It would be 1907 before members were ready to change their minds on this issue, agreeing to open negotiations with the Master Printers Association and the Newspaper Proprietors Association over a scale of hours and wages, and to talk to the London Society of Compositors to have their association recognised as the custodian of readers’ interests. Within weeks, agreement was reached with the newspaper proprietors on a wage scale that would give readers on morning papers £3 for a 42-hour week, plus overtime. Negotiations with the master printers took rather longer, and it took the intervention of the Labour Department at the Board of Trade before agreement was reached for a minimum pay rate of 42 shillings for up to 52.5 hours a week. The association now became involved in a wider campaign by print unions for a 48-hour week. By 1911, the issue had come to a head, and the readers joined other London print unions in a strike to reduce working hours, settling eventually on a 50-hour week. During the first world war, the association even affiliated to the TUC. In 1928, the association was strong enough to institute an entrance examination ­– a good way of restricting the number of applicants for vacancies. At first the tests involved only proof-reading, but these were later extended to cover grammar, punctuation, capitalisation, the division of words, formation of plurals, abbreviations, reference mark s, accents, signs and symbols, paper sizes, the names of common type faces, and questions designed to test a candidate’s knowledge of English literature, proverbs and phrases. The ACP headquarters, adjoining Dr Johnson’s house in Gough Square. Drawin by David Knight from Passed for Press: a centenary history of the ACP , by TN Shane (Association of Correctors of the Press, 1954). Throughout the 1930s and beyond, the fortunes of the association rose and fell with those of the Fleet Street print unions more generally. In 1965, it transferred its engagements to the National Graphical Association – the direct descendent of the London Society of Compositors. That in turn eventually merged with the Society of Graphical and Allied Trades, representing the less skilled print workers to become the Graphical, Paper and Media Union. In 2004, the GPMU became part of Amicus. 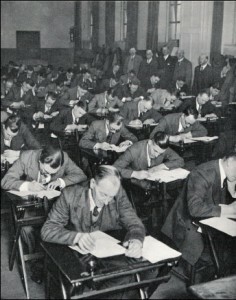 Would-be readers sit the ACP entrance exam at the London School of Printing on 2 January 1936. The following extract is from Passed for Press: a centenary history of the ACP , by TN Shane (Association of Correctors of the Press, 1954). A great deal of the effectiveness of any organisation depends necessarily on the capabilities of the people whose job it is to look after the machinery. The Association of Correctors of the Press has been fortunate from the day of its inauguration in the men who have been entrusted with the management of its affairs. The tasks they perform are, of course, very much more complex to-day than they were a century ago, when it was a straightforward matter of giving notices of meetings and collecting subscriptions- though even that, of course, is not quite as simple as it sounds. For about the first so years the Association had no staff in the technical sense of the word. The secretary and treasurer were voluntary part-time officials, who earned their living as readers, like the rest of the membership. There was no regular chairman: more often than not, in the early days, the secretary undertook that function at the ordinary meetings. Since 1854 there have been twelve secretaries. The first, J. M. Philp (‘Delta’ of Henry Vemon’s circular), held the post until he left the profession in August 1855 and was succeeded by R. S. Maurice, who at the same time took over the treasurership from W. Johnson. Maurice was succeeded in 1862 by J. E. Pincott,whose career as secretary has been described in a previous chapter. In Pincott’s last year the offices of secretary and treasurer were again separated, the latter job going to J. C. Forrest. The new treasurer had considerable journalistic ability, and wrote a good deal for the Family Herald . J. H. Murray succeeded Pincott as secretary in 1867, but resigned for health Reasons a few months after his election, his place being filled by George Chaloner, who played such an active part in bringing the situation of readers to the notice of the public. The next two holders of the office, A. F. Whittaker (1873-90) and G. Wilbraham (1890-96), though both men of undoubted ability, served the Association during its dog days, when they had little chance to leave their impress on its character. John Randall, Wilbraham’s successor, was the last of the part-time secretaries. At different times he served also as chairman, treasurer and trustee, creating a unique record of service. When S. F. Crampin succeeded him, in 1904 the Association had long been engaged in courses which made it imperative that there should be a competent, reliable official always on duty. Crampin, with his zeal, his progressive ideas, and his flair for finance, was just the man for the job. He left school at the age of twelve to become cashier in a small business, and kept the job for four years. Then he was apprenticed as a compositor, working in various offices until in 1887 he became a reader in a publishing house. In 1896 he went to the Estates Gazette, and was in that employment up to the time of his election. Avid for self-improvement, he studied Latin, French and other subjects at the Working Men’s College. It was during this period that he learned from a teacher at the College of the existence of the A.C.P., of which he became a member in 1892.Five years later he was elected to the executive committee. It was during Crampin’s term of office that the A.C.P. built up its funds from those of a comparatively poor voluntary association to those of a wealthy modem trade union; it was then, too, that the Association weathered the storms of two major strikes and a world war. While every officer and member must share the credit for these achievements, it would be churlish to deny special credit to Crampin, the man for whom the Association’s welfare was a full-time concern. When Crampin retired in 1931 H. S. Temple secured election by a large majority. The times were far from easy, but the test of his capabilities proved him. to be one of the most valuable officials who had ever served the Association. A skilful negotiator and a first-class committee man, he did a great deal to put the A.C.P. on the map of the printing industry. For the year 1938 he served as chairman of the Joint Industrial Council, the highest honour the printing industry can confer. He was keenly interested in his craft – he had been a reader at Harrison & Sons – and wrote a valuable booklet, ‘The Duties and Responsibilities of a Reader’. He also contributed an article on ‘Trade Unionism in the Printing Industry’ to a survey of British Trade Unionism edited by G. D. H. Cole. In the early days of 1947 Temple fell ill for the first time since his appointment and died suddenly a few weeks later. The present secretary, C. W. Wallace, has been in the service of the A.C.P for nearly 35 years, having joined the staff in 1919, shortly after demobilisation from the Royal Naval Air Service. In February 1947 he was appointed assistant secretary, an office which had remained vacant since 1932.In June of the same year he was elected to his present position by an overwhelming majority from among seven candidates. Since the ‘Chair’ became a regular feature of the executive there have been eight occupants, the first of whom was W. Hilton, who played a prominent part in the establishment of readers’ pensions. His successors were J. Randall (1904-09), during whose period of office the A.C.P. became a trade union; S. Andrewartha (1909-17); W. H. Shortell (1917-30),an outstandingly popular officer who played a notable part in the improvement of benefit schemes; A. Jennings (1930-45), for some years, as ‘Vox Quaerentis’, a regular contributor of articles on professional and literary topics to A.C.P. notice papers; E. A. Holmes (1945-50).who will be specially remembered for his proposals for the reconstruction of the superannuation fund in its present form; L. C. Monard (1950-51);and the present chairman, F. F. Marston. On the eve of its centenary celebrations, the Association of Correctors of the Press is firmly established as a well-served, compact, and efficient unit of the trade union movement. As a craft union its status is unassailable, while its value to its members as the guardian of their interests is affirmed by the loyalty which prevails in every recurrent crisis. The problems which the Association faces almost daily are as difficult as, and probably more complex than, any which confronted it in the past. But its ability to take good care of itself is as manifest to-day as it was in the periods of stress and turmoil recorded in the preceding pages. Its safeguard now, as then, is the high standard of conduct by which members have for the past hundred years been guided. both as individuals and as a corporate body. The following report of Charles Dickens’ speech to the readers’ meeting at the Salisbury Hotel on 17 September 1867 is from The Times . That as the meeting was convened, not to hear him, but to hear a statement of facts and figures very nearly affecting the personal interests of the great majority of those present, his preface to the proceedings need be very brief. Of the details of the question he knew, of his own knowledge, absolutely nothing; but he had consented to occupy the chair on that occasion at the request of the London Association of Correctors of the Press for two reasons– first, because he thought that openness and publicity in such cases were a very wholesome example very much needed at this time, and were highly becoming to a body of men associated with that great public safeguard–the Press; secondly, because he knew from some slight practical experience, what the duties of correctors of the press were, and how their duties were usually discharged; and he could testify, and did testify, that they were not mechanical, that they were not mere matters of manipulation and routine; but that they required from those who performed them much natural intelligence, much super-added cultivation, readiness of reference, quickness of resource, an excellent memory, and a clear understanding. He most gratefully acknowledged that he had never gone through the sheets of any book that he had written, without having presented to him by the correctors of the press something that he had overlooked, some slight inconsistency into which he had fallen, some little lapse he had made–in short, without having set down in black and white some unquestionable indication that he had been closely followed through the work by a patient and trained mind, and not merely by a skilful eye. And in this declaration he had not the slightest doubt that the great body of his brother and sister writers would, as a plain act of justice, readily concur. For these plain reasons he was there; and being there he begged to assure them that every one present – that every speaker – would have a patient hearing, whatever his opinions might be. Passed for Press: a centenary history of the ACP, TN Shane (Association of Correctors of the Press, 1954 ). Records of the Association of Correctors of the Press can be found at the Modern Records Centre, Warwick University.